Stanmore Choral Society are delighted to say that we have appointed Harry Bradford to be our new Musical Director, starting on Monday 9th September 2019. We are looking forward to working with him on some interesting music – more details to come. Our Next Concert for 2019 will be “Mid-Atlantic Song” on Saturday 13th July. With Charles Pott (baritone) & Paul Ayres (piano) conducted by James Mooney-Dutton. 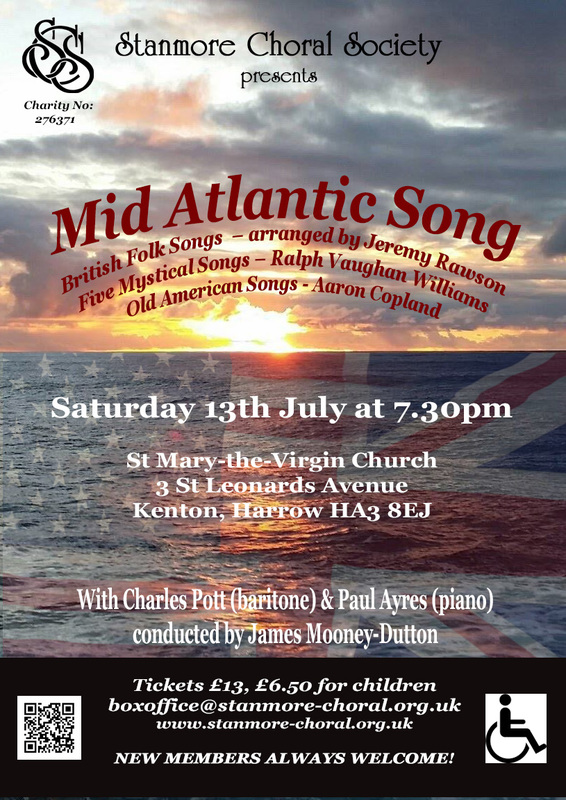 British Folk Songs – arranged by Jeremy Rawson. Rehearsals start on Monday 1st April at 7.45pm-9.45pm at St. William of York Church Hall, Du Cross Drive, HA7 4TJ. Just call Mo: 07876 793012 to find out more about us. Or just come along on 1st April: we will make you very welcome. NEW SINGERS WANTED: we invite you to join us, or inform friends about our search for new singers, particularly tenors and basses to join us on Monday April 1st 2019 when rehearsals for the next concert begin. This versatile and friendly non-auditioned choir is currently recruiting Tenors and Basses, although singers for all sections are always welcome. The choir is about 50-strong and draws singers from Stanmore, Harrow, Kenton, Pinner, Ruislip, Watford, Bushey, Barnet, Edgware, Burnt Oak, Colindale, Wembley and Mill Hill. The choir will be led for the next two terms by James Mooney-Dutton. The choir produces three main concerts and a carol concert each year. Click here for details of this season’s concerts. If you enjoy singing, you are very welcome to come along and join us. Rehearsals for the next concert start on Monday 1st April, at our usual time and venue, 7.45pm to 9.45pm at the church hall of St William of York, Du Cros Drive, Stanmore, HA7 4TJ . Nearest underground stations are Canons Park or Stanmore; there is also off-street parking.